FMEA Development must also use past data that may include both success and failure. This data is the basis for possible Failure Modes and Causes from Eight Disciplines for Problem Solving (8D) or Occurrence Rankings. 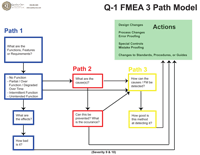 The Three Path Model for vertical FMEA development is a method which organizes teams and activities around failure modes and severities. It is important to look for a defined method in the FMEA training. Working across the page (horizontally) is inappropriate and inefficient. Teaching the form column by column alone does not provide the participant with any proficiency.